All five species of Pacific salmon and Steelhead migrate from the salt water to freshwater in order to reproduce (spawn). Since 2004, NSEA has removed 70 barriers that made fish migration difficult or impossible opening over 50 miles of habitat that can now be used by salmon. We believe education should be accessible to all students. That's why we have always offered our education programs to schools at no cost. This is only possible because of our generous and thoughtful supporters. Volunteers contribute over 15,000 hours toward NSEA's mission each year. We strive to lower each and every hurdle to volunteerism, attempting to make participation in salmon recovery accessible to everyone. Prospering through two recessions, NSEA focuses on evolution before growth. Through partnerships with the Washington Service Corps (a part of the AmeriCorps Network) and Washington Conservation Corps we have learned how to maximize our impact on salmon recovery. For 15 years, NSEA has grown its own native plants from bare root stalk. It's more cost effective and it makes our community work parties more rewarding and successful. Our education team is busy. They teach thousands of students each year from each of the seven school districts in Whatcom County. We are nearing the completion of 400 restoration projects throughout Whatcom County that, as a collection, work to improve water quality, salmon migration access, and watershed health. In 2014, NSEA reached its goal of building the Northwest Salmon Recovery Fund. This partially endowed fund ensures that NSEA is financially viable through the ebbs and flows of salmon recovery work . NSEA purchased a permanent home and base-of-operations for salmon recovery in early July of 2015. Because of the significant challenges salmon face, NSEA's leadership decided to sink stable roots in Whatcom County to complement a long-range strategy. We are still in the process of raising additional funds to renovate and upgrade the property. We reached the Capital Campaign goal at the end of July 2016. Puget Sound Chinook, including those populations in the Nooksack River Watershed, were listed as threatened under the federal Endangered Species Act in 1999. 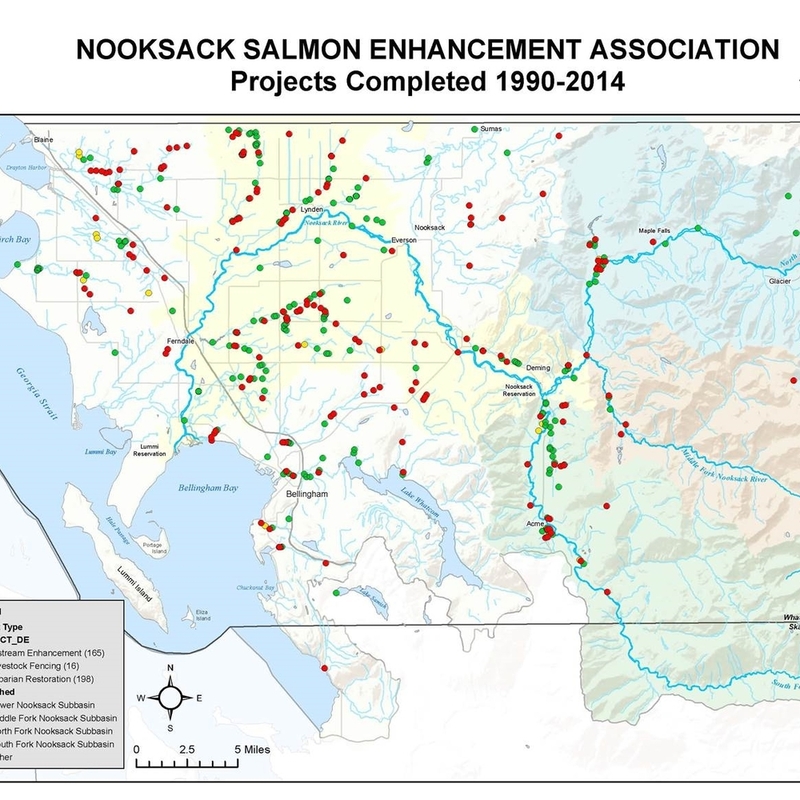 NSEA has participated along with other organizations in habitat restoration and protection actions as set out in “The Road to Salmon Recovery in the Nooksack Basin” as established in June 2005.